Turkish voice - Iraqi qanun - Belgian cello. One language. The songs are composed by Melike and Osama. 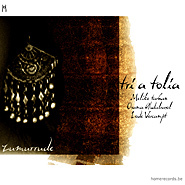 Osama also arranged the music, together with one of Belgium's finest cellists, Lode Vercampt, who has put his own stamp on this originally eastern music.